Thanksgiving is the perfect time to relax and hang out with family and friends. But if you’re looking for a little something more besides just the traditional face stuffing and football watching this year, then you’ll want to give one of these unique new Thanksgiving traditions a try. Make a game out of finding a seat at the table: Forget boring nametags and make a little game as everyone finds their seat at the table. Instead of simply writing the person’s name on a nametag, try using three adjectives that describe them and then have the group guess who should be taking that seat. Create a piece of art to remember this particular Thanksgiving: Get a piece of white posterboard and several Sharpies and invite all of your guests to write what they’re thankful for and then sign their name. Do this each year and you’ll enjoy being able to look back and remember the various guests you’ve had at your Thanksgiving table over the years. Get active before the meal: Thanksgiving is all about feasting, which can leave you feeling a little sluggish when the whole thing is done. Counteract this by getting active ahead of time. Many cities and towns have “Turkey Trots” or other easy races that take place on Thanksgiving. Do one of these with your family in the morning and then you won’t feel as guilty about enjoying that second piece of pie later in the day. Volunteer in your community: You’re fortunate enough to enjoy a big meal with the people you love, but not everyone in your area is as lucky. Take some time on Thanksgiving to give back by volunteering in your community. Grab a few family members or friends and do some volunteer work earlier in the day. It’s much more productive than just sitting around watching the parade. 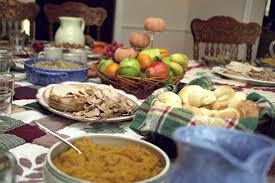 What are some of your favorite Thanksgiving traditions? Share them with us in the comments!